It turns out that they do, sort of, and a NASA-funded researcher at the University of Iowa has figured out how to find them. "We call them X-points or electron diffusion regions," explains plasma physicist Jack Scudder of the University of Iowa. "They're places where the magnetic field of Earth connects to the magnetic field of the Sun, creating an uninterrupted path leading from our own planet to the sun's atmosphere 93 million miles away." Observations by NASA's THEMIS spacecraft and Europe's Cluster probes suggest that these magnetic portals open and close dozens of times each day. They're typically located a few tens of thousands of kilometers from Earth where the geomagnetic field meets the onrushing solar wind. Most portals are small and short-lived; others are yawning, vast, and sustained. Tons of energetic particles can flow through the openings, heating Earth's upper atmosphere, sparking geomagnetic storms, and igniting bright polar auroras. NASA is planning a mission called "MMS," short for Magnetospheric Multiscale Mission, due to launch in 2014, to study the phenomenon. 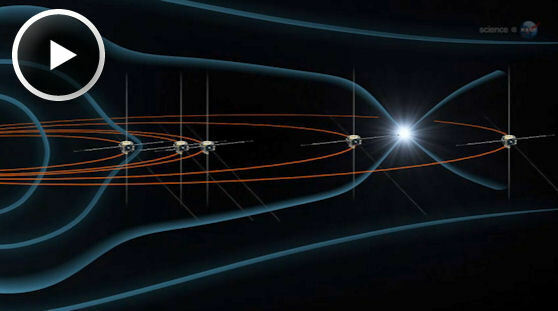 Bristling with energetic particle detectors and magnetic sensors, the four spacecraft of MMS will spread out in Earth's magnetosphere and surround the portals to observe how they work. Just one problem: Finding them. Magnetic portals are invisible, unstable, and elusive. They open and close without warning "and there are no signposts to guide us in," notes Scudder. 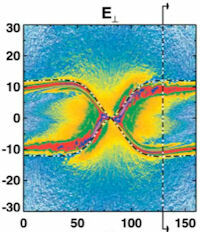 Computer models based on data from NASA's Polar spacecraft, circa 1998, provided crucial clues to finding magnetic X-points. Actually, there are signposts, and Scudder has found them. Portals form via the process of magnetic reconnection. Mingling lines of magnetic force from the sun and Earth criss-cross and join to create the openings. "X-points" are where the criss-cross takes place. The sudden joining of magnetic fields can propel jets of charged particles from the X-point, creating an "electron diffusion region." "In the late 1990s, NASA's Polar spacecraft spent years in Earth's magnetosphere," explains Scudder, "and it encountered many X-points during its mission." Because Polar carried sensors similar to those of MMS, Scudder decided to see how an X-point looked to Polar. "Using Polar data, we have found five simple combinations of magnetic field and energetic particle measurements that tell us when we've come across an X-point or an electron diffusion region. A single spacecraft, properly instrumented, can make these measurements." This means that single member of the MMS constellation using the diagnostics can find a portal and alert other members of the constellation. Mission planners long thought that MMS might have to spend a year or so learning to find portals before it could study them. Scudder's work short cuts the process, allowing MMS to get to work without delay. It's a shortcut worthy of the best portals of fiction, only this time the portals are real. And with the new "signposts" we know how to find them. The work of Scudder and colleagues is described in complete detail in the June 1 issue of the Physical Review Letters. MMS Credits: Science team members and instrument development are provided by the University of New Hampshire; Johns Hopkins University Applied Physics Laboratory; NASA Goddard; University of Colorado; Lockheed Martin Advanced Technology Center; Rice University; the University of Iowa; Aerospace Corporation; and the University of California-Los Angeles. International contributions to the MMS instrument suite are provided by the Austrian Academy of Sciences; Sweden's Royal Institute of Technology and Institute of Space Physics; France's Plasma Physics Laboratory and Toulouse Space Center; and Japan's Institute of Space and Astronautical Science. MMS is a NASA Science Mission Directorate Heliophysics mission in the Solar Terrestrial Probes Program. MMS is managed by NASA Goddard. Kennedy Space Center is providing launch services.